Class Skills - special abilities restricted by your class. Each class has 3 skill trees with 10 abilities. You can't master abilities of other class in the game. Armor Skills - responsible for armor efficiency and for your defence. Vampire - skills that allow you to use Vampire abilities. Werwolf - skills that allow you to use Werwolf abilities. You can also join different guilds and receive new skill lines for that. Mages Guild - becomes available if you join Mages Guild. Fighters Guild - becoves available if you join Fighters Guild. Dark Brotherhood - becoves available if you join Dark Brotherhood (Will be added in post-launch updates). Thieves Guild - becoves available if you join Thieves Guild (Will be added in post-launch updates). Each category has sub categories with active or passive abilities. Passive abilities do not require any actions from the player; when you invest skill points in passive abilities you automatically receive the result. For example you can increase your passive defense or damage. Effects of passive abilities are permanent. Active abilities require player’s actions for activation, such abilities must be places on your hotbar and can be activated from the hotbar only. The example of such an ability is dual-strike – you hit your enemy with both weapons at once. When you have definite abilities on your hotbar and use it during the game you receive experience for that ability and the more you use it the faster your progress will be. When you reach the 4th level in Weapon skill or Class skill you can Morph it by adding new effects to the skill. For example, you can add knockback effect or stunning effect. Morph abilities change for different skills, this system allows you to create a unique character with a unique set of skills. You can manage your abilities and extra effects yourself. A general idea of Elder Scrolls Online is to let player pick up any weapon and explore different abilities and talents. It doesn't matter how you begin, you can change your specialization any time. There will be enough skill points to unlock all your talents and try different builds. 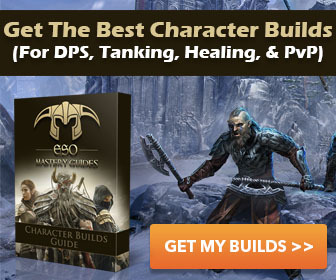 ESO provides player with many skills and it is possible to create a lot of Builds. A player may want to redistribute points after some time. You’ll be able to reset your skills, receiving room to try new things or undo choices you aren’t happy with. Though it is possible, it will cost you money and the price will be rather high. Thus it’s not a cheap option that can be used every hour. They are giving us total control to spend the points as we wish. More for crafting or more for passives and combat skills. I understand the total skill points available is 250 so there is plenty to do as we wish. Some games you are limited to only one crafting profession per toon. ESO crafting is very liberal. BTW, I was trying to find the list of skills and passives for the restoration staff and the destro staff. I may be overlooking something but I figured they would be under skills in the weapon section. Please provide me direction. We are going to add Staff skills soon. Hey guys, I noticed that you have restoration staff skills under destruction staff and vice versa. Just thought I'd let you know! This site is awesome! Thanks for all the helpful tips. I look forward to see the morphing options displayed in skills soon! Keep up the good work guys!